When you have a sick child, those every day things that other families take for granted sometimes become dreams and hopes that always seem just out of reach. Things like going for a walk to the park, cuddles in bed in the morning, sharing a big stack of homemade pancakes for breakfast and dancing around the living room in your pjs. And then there are birthdays. 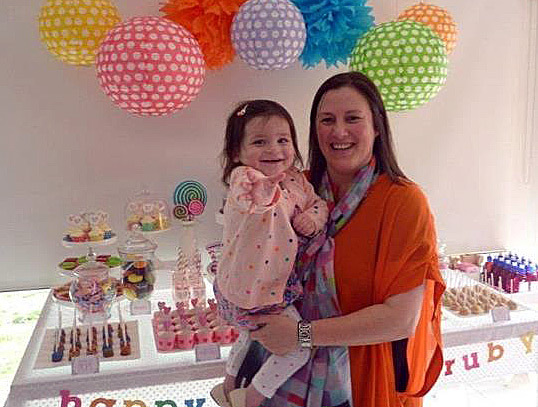 Chronic illness meant little Ruby had already spent more than seven months of her young life in hospital when it came time to celebrate her second birthday, so mum Rebecca crossed her fingers (and everything else) that her daughter would be well enough to be home on the day and threw herself into the planning. It was as much to provide a distraction from the heartache of Ruby’s illness and ongoing hospital treatment for the entire family, including big brother Jack, as for the party itself. 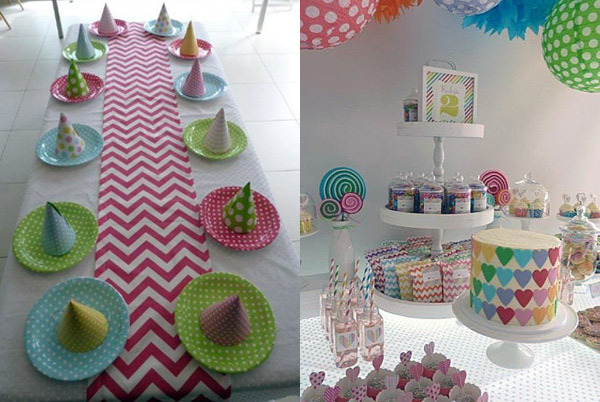 Rebecca initially chose a rainbow theme for the celebration, but had no luck finding an invitation she liked. 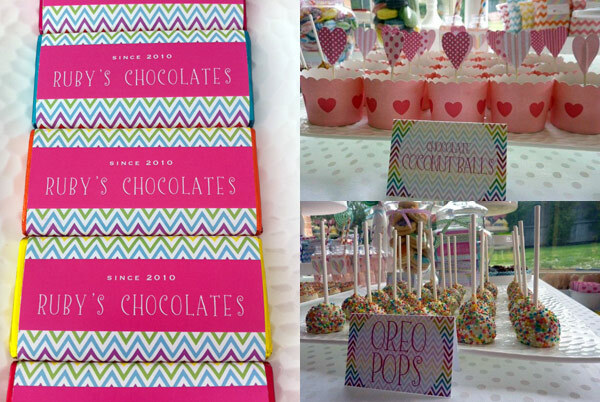 So, undaunted, she dumped the rainbow and went with rainbow-inspired bright colours instead, helped along by an entire collection of customised printables found over at Etsy’s Pretty Girl Designs, including those hot pink and chevron chocolate bar wrappers. 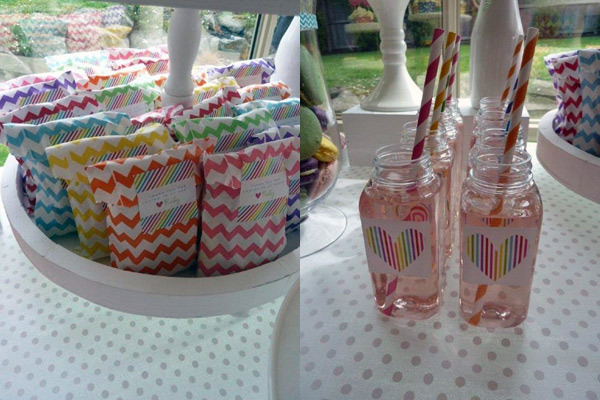 Tissue paper pompoms and polkadot lanterns that dangled over the lollipop and love hearts sweets table (pictured top) came from Specklefarm, while the chevron loot bags, bright paper straws and lollipop candle came from Hey Yo Yo. Those plastic drink bottles – more toddler-friendly than the ultra-popular mini glass bottles spotted at just about every party these days – were a Bon Bon Boutique find. Now how’s this for dedication. Rebecca wanted little chocolate hearts as favours for the grown-ups, but rather than opting for ready-made hearts, she made them herself and handwrapped each one individually in foil paper found at Spotlight to match the colours of the party theme. 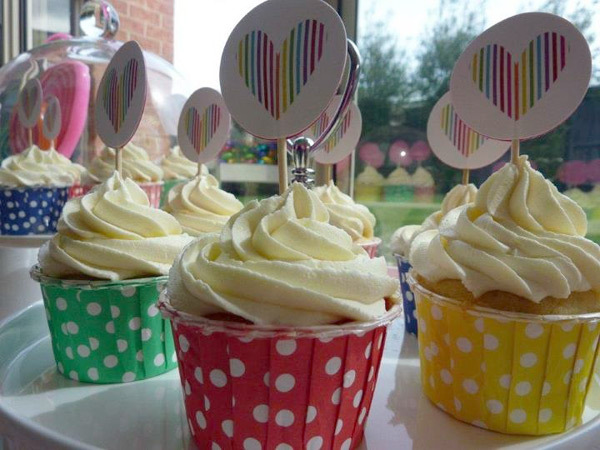 Ah, a mum after my own party-mad heart! Ruby’s illness means she can’t eat or drink normally and the plucky toddler instead is fed through a tube, making planning a party menu a rather bittersweet experience for Rebecca. 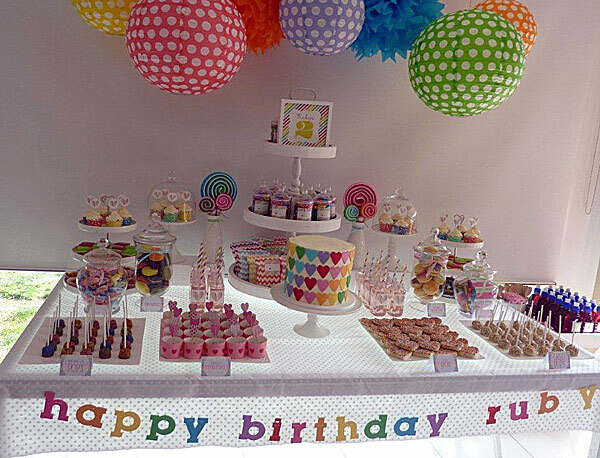 She crammed it with all manner of party treats that she hopes her daughter will get to try for herself one day – chocolate crackles, marshmallow pops, jelly slice, coconut balls, honey joys and heart-shaped fairy bread. While Ruby couldn’t eat the birthday cake, it sure provided a feast for her eyes! 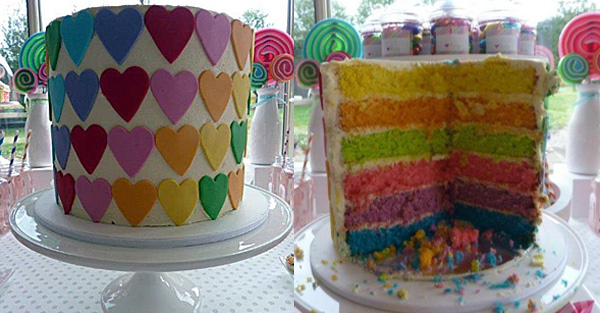 Resplendent on the outside with rows and rows of sugar hearts placed just so, it had bright rainbow layers inside and came from Bell’s Cakes in Geelong, as did the buttercream-topped cupcakes. The pretty plates and wooden cutlery, painstakingly handstamped to match by Rebecca, came from Sweet Style. Now please join us in two great big cheers for the brave birthday girl and her equally brave mumma! Our birthday wish to your family, from the very bottom of our hearts, is that the doctors will soon be able to find a cure for Ruby’s illness so that you can get back to doing all those wonderfully mundane things that other families so often take for granted.